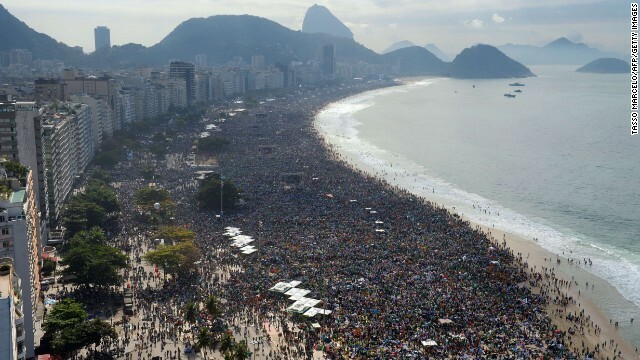 Hundreds of thousands crowd Copacabana beach in Rio de Janeiro, waiting for Pope Francis to lead a worship service. Rio de Janeiro (CNN) - Pope Francis closed out World Youth Day with a final Mass before a giant crowd of millions on Copacabana Beach. Massive crowds followed Francis at every stop on the trip. Organizers and local officials said 1.5 million people came out for the Way of the Cross observance on Friday. The mayor's office in Rio said final estimates for a prayer vigil on Saturday could reach up to 3 million. On Sunday, the Vatican citing civil authorizes put the crowd for the final Mass over 3 million. Rio de Janeiro (CNN) - We didn’t need Pope Francis’ trip to Brazil this week to grasp that the new pontiff, who’s set a tone of simplicity and love for ordinary people, is a hit. Polls around the world show approval ratings that would be the envy of any politician or celebrity, while vast crowds show up in Rome for even his most routine activities. What Brazil confirmed, perhaps, is that his act plays as well on the road as at home. During his week in Brazil for World Youth Day, an international Catholic event, mob scenes erupted everywhere Francis went, despite cold temperatures and driving rain for much of the week. Young Catholic pilgrims attending World Youth Day on Copacabana Beach. 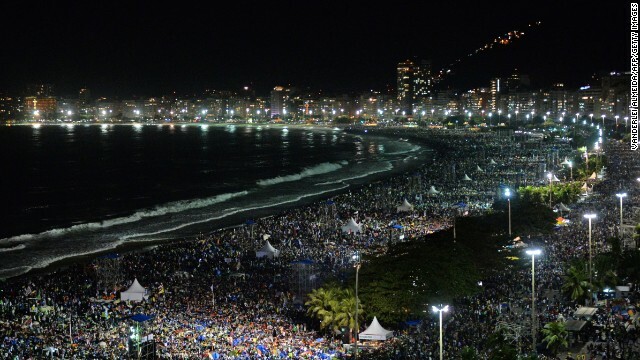 Rio de Janeiro (CNN) - A massive crowd packed Copacabana Beach late Saturday for a prayer service with Pope Francis. The pope addressed Catholic pilgrims who came for the weeklong World Youth Day celebration. Organizers said 3 million attended the service. They cited the mayor's office and police for the crowd estimates, which nearly doubled the 1.6 million who came here for a 2006 Rolling Stones concert and matched the 3 million who came for the 2000 millennium celebration. Pope Francis speaks to the crowd from a balcony of the San Joaquin Episcopal Palace on July 26, 2013 in Rio de Janeiro, Brazil. RIO DE JANEIRO (CNN) - With a blasting medley of bossa nova music as a prelude, Pope Francis addressed about a million worshippers in Copacabana beach on Thursday, lacing his message to a new generation of Catholics with Brazilian street jargon. 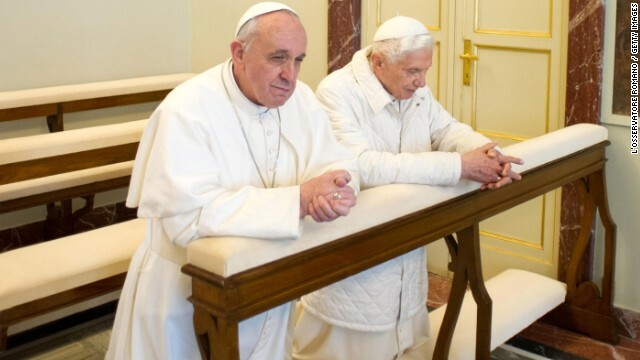 "Bota Fe" - put on faith - was the antidote to what he called growing materialism and discontent, the pontiff said. "What can we do? Bota Fe," he said. "If we want to have real meaning and fulfillment, as you want and you deserve ... put on faith." The thread of the pontiff's speech resonated with Brazil's youth, many of whom are expressing disenchantment with their government. Rio de Janeiro (CNN) - A small explosive device was found Sunday near a religious shrine in Brazil that Pope Francis is scheduled to visit later this week, Sao Paulo military police announced just few hours after the pope arrived on Monday. The homemade device was found July 21, during police training in Aparecida, the site of a massive shrine to the Virgin Mary, Brazilian police said. It was constructed out of a small, plastic cylinder and duct tape. A special tactical group detonated the explosive without causing any injuries, according to the police. 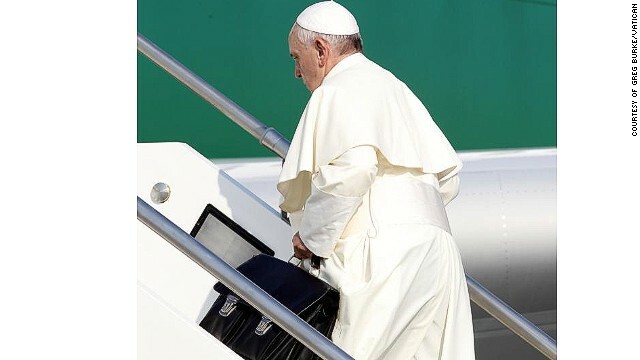 Pope Francis boards the plane on July 22 for Brazil -- with a single carry-on bag. 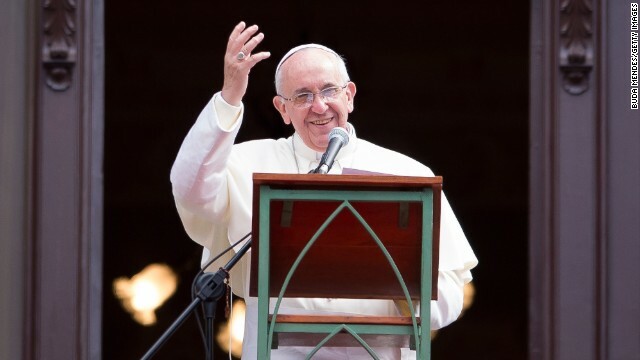 Rio de Janeiro (CNN) – For the first time in the history of the Catholic Church, a Latin-American pope will touch down on his own continent on Monday. Pope Francis, the 76-year-old Argentine, begins his first apostolic visit Monday in Brazil, home to the world’s largest Catholic population. The pope will be participating in World Youth Day, a weeklong celebration aimed at revitalizing young Catholics, and the church, here and around the world. Organizers said 400,000 pilgrims from around the world had registered, though the crowds are expected to be much larger as people try to catch a glimpse of the pontiff known as the “people’s pope.” Many of the events with the pope will be open to the public and not just the pilgrims.